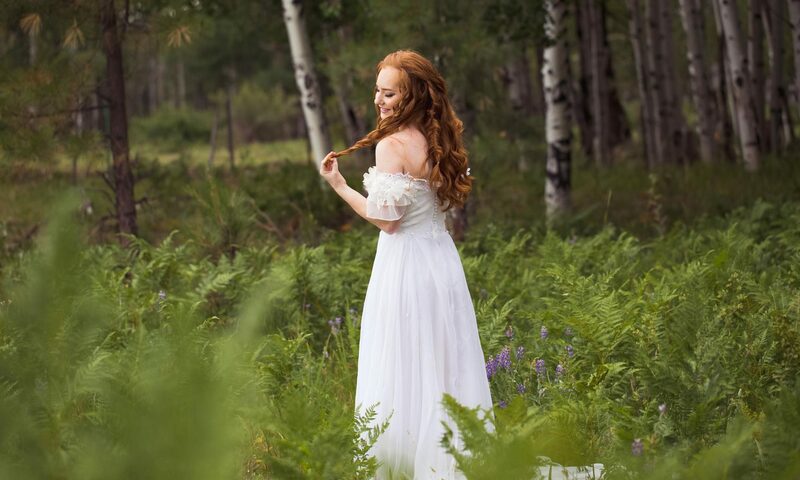 One of the main reasons Couples choose Flagstaff as a wedding location is because of Forest Weddings! From stunning mountain views with pine forests and aspen groves, to the beautiful grasses and wildflowers; you just can’t beat a Forest Wedding Venue. If you have found this post, you may be wondering…. “How can I have a forest wedding?” Well, we can help! We offer everything from Elopements and Intimate Forest Weddings to large Ceremonies and Tented Receptions. Flagstaff Wedding Packages is the only authorized Outfitter and Guide for Weddings in Coconino National Forest. We ensure that the many policies, procedures and guidelines in place by the USDA Forest Service are followed perfectly for your event. Our goal is to simplify the planning process and create your perfect Forest Wedding. When you are ready to start planning, Contact Us to learn more about the available package options. The Forest Service has approved specific locations where Forest Weddings may be held. For each location, there is a set of guidelines regarding times of use, seasonal availability, capacity and specific areas of use. These designated wedding locations were studied extensively and the guidelines were prepared to minimize the impacts of regular events on the surrounding environment. When you contact us, we can discuss these location options and help you determine which location will be the best fit for your wedding. We have some locations that offer Pine forests, some with Aspen trees, some with Mountain views, and others with a combination of those things. Each location is unique, with it’s own set of pro’s and con’s, and we are happy to explain all of these things during your initial consultation. One of the first questions we get asked is: “What do Forest Weddings cost?“. The quick answer is…. it depends on what you would like to do. However, we are happy to share some ballpark pricing with you below. All of our Packages are All-Inclusive Rates, meaning Flagstaff Wedding Packages supplies all products and services in the package at one flat rate. There are no additional taxes or gratuities on top of our package prices. Each Package, regardless of starting price point will include your Wedding Officiant, Photographer, and Coordinator. As Packages go up in price, additional items are included like Food, Music, Desserts, Event Rentals, Floral & Decor, Restrooms, Power, etc . Elopement Packages – Elopements start as low as $1200 for a very basic Couple only package. Upgraded Couple’s packages are available. Elopement packages can also be customized for groups up to 10 for an additional cost. Intimate Wedding Packages – Packages for small groups of 10 to 25 will generally range from $3000 to $5000. Some of the packages in this price range are ceremony only, and some offer light refreshments or picnics. Small Wedding Packages – Packages for small to medium size groups of 25 to 75 typically range between $5000 and $10,000. These packages are well suited for Couples working with a limited budget and modest guest counts. The packages in this category offer a casual, laid back wedding during the daylight hours. Some of the packages in this price range are ceremony only, and some offer light refreshments or a casual bbq meal. Ceremony & Open-Air Reception Packages (no tent) – if you have a group over 75, or if you are looking to have a complete package with a ceremony and dinner reception, our most budget friendly option is to have a daytime “open-air” style reception. Packages in this category, for 100 people, can range from $12,500 to $25,000 or $125 – $250 per person. This is a bit of a risky choice due to possible weather problems and we may not be able to accomodate all date requests. Ceremony & Tented Reception Packages – If you are looking to have a forest ceremony and full reception in an event tent; the packages below will give you an idea of what price range to expect. Our Economy Forest Wedding and Tented Reception Package for 50 guests starts at $15,000 or $300 per person. Our Premium Forest Wedding Ceremony and Reception Package for 100 people is going to average about $35,000 or $350 per person. Luxury Forest Wedding and Reception Packages are available and can run anywhere from $50,000 or $500 per person & up. If you are in love with the idea of having a Forest Wedding, our best advice is to establish your target budget first. Then, it’s best to remain flexible on your guest count until you explore all the available package options. We can offer some amazing experiences at almost any price point. Using the per person pricing above, you can easily estimate what the budget range should be for the type of wedding you wish to have. A permit is always required for Forest Weddings, regardless of how many guests in the group. You must select an approved Wedding location, you cannot go to just any place in the Forest and have a Wedding. Locations, times / seasons of use, and site capacity are all things that are regulated by the Forest Service. A Special Use Permit that an individual typically applies for is not a Commercial Permit, which means, in that case, that you may only host a 100% DIY wedding. Under a regular Special Use Permit, you may not hire anyone to provide a product or service on Forest land. For example, you would not be allowed to hire a catering company or a rental company to come to the location and setup. Similarly, you would not be allowed to hire a minister or photographer, or other “service” company to come to the location to provide their service. These things would be considered commercial use, and are not permitted under a regular Special Use Permit. A business may not provide any product or service on Forest land without a Commercial Permit. Violating the Forest Service regulations can result in tickets with fines, as well as having your event shutdown entirely. Flagstaff Wedding Packages is currently the only company to hold a Commercial Outfitter and Guide permit. As a result we are able to offer to hold weddings at various locations in the Coconino National Forest.